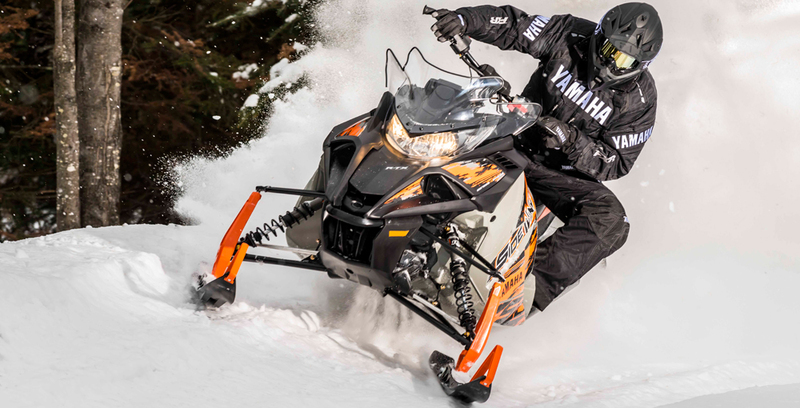 Yamaha wins big in the ultra-sport trail category. Not since its vaunted SRX series has Yamaha fielded a set of all-world champions like the Sidewinder series. They are powerful with Yamaha’s “ultra-performance” turbocharged 998cc three cylinder four-stroke. They have proven handling with the Arctic Cat sourced platform and suspensions. And they have that Yamaha breeding that puts its own special touches on the finished product. Yamaha wins big and so do Yamaha Sidewinder R-TX buyers. 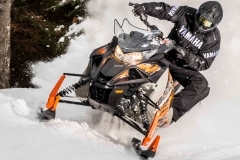 Yamaha’s Sidewinder R-TX will be the hottest trail sled you can buy for model year 2017. Well, other than Arctic Cat’s Thundercat. 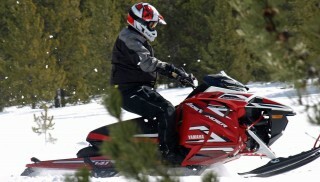 Of the Sidewinder models, the R-TX alone is Yamaha’s speed trail statement. The R-TX is about performance – all about performance. 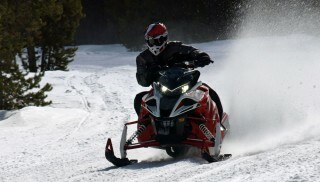 Under the hood is some of the smoothest performing high-performance engines snowmobiling has ever seen. 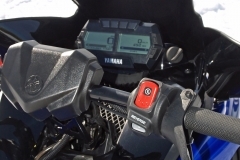 Officially Yamaha claims 180 horsepower at maximum revs. Unofficially you’ll see reports of 200 horsepower. Does it really matter? Just know that when you push the throttle lever to the bar and hold it, the sled will quickly – and we do mean quickly – achieve triple digits. It’s incredibly smooth power, linear like a turbine or Tesla electric ramping up. Just as incredibly, that power is manageable. We’d be lying if we said that we weren’t intimidated on our first ride. 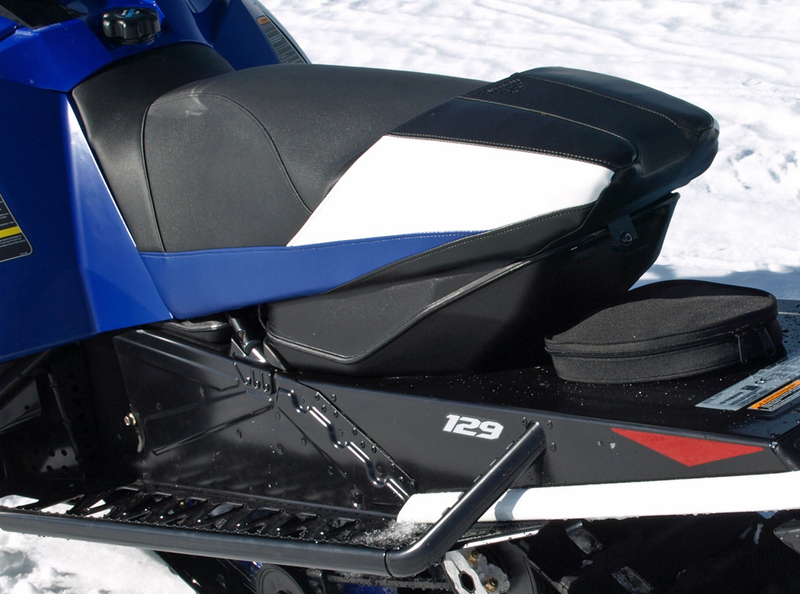 We knew from Yamaha spokesmen that the sled had the power. Heck, after they told us the sled had 180 hp and we asked if that was understated, these Yamaha spokesmen couldn’t contain slight smiles suggesting that 180 was a starting point. We knew that our test course could be icy in the mornings, especially in the corners. How would the sled manage the power to the track? Would it hit hard and unsettle the sled as you throttled out of the turn? Would the 129-inch track and its 1.25-inch lugs be overpowered by the Sidewinder’s power? Would the sled be stable with all that power? The Camso 129-inch Ripsaw track with 1.25-inch lug profile is a proven design and is becoming the new standard for high performance trail sleds. In reality we shouldn’t have been intimidated in the least. After all, the previous generation 9000 series Arctic Cat 129 inchers came with a turbocharged Suzuki twin with nearly as much power. So, what was the big deal? 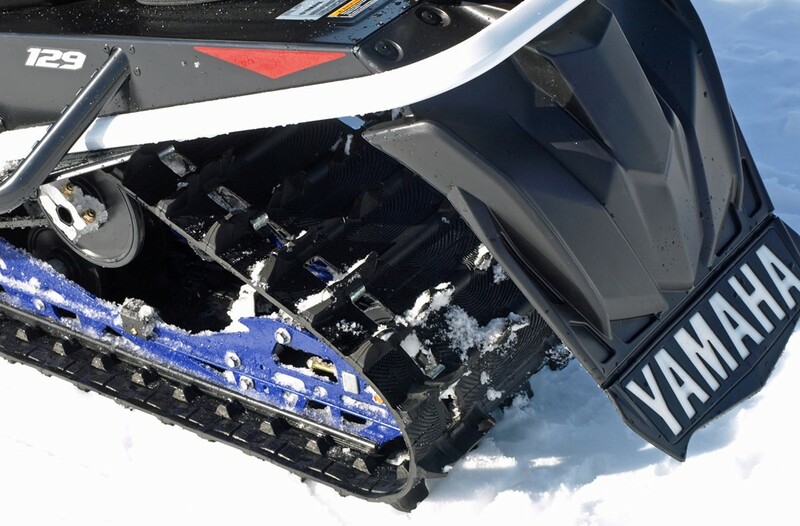 When we rationalized our questions, except for the new Yamaha 998cc Genesis Turbo engine, we’d ridden similar Cat-chassis sleds before. We knew how the chassis and suspensions worked with that much power, but we were anxious about how the Yamaha fit into that old equation. The answer is very well! Actually, exceptionally well! The Sidewinder turbo uses upgraded Yamaha clutching specifically tuned for the power. But with the way this turbo delivers its torque we figure you don’t need to be a clutch tuning guru to get this thing into its sweet spot, which seems to be between idle and wide open injectors. That was the main thing with the R-TX, it totally surprised us with how well it ramped up to speed. If we wanted to dilly-dally and check out the needle pattern on a western pine, the R-TX never faltered. When we stepped up the pace to run West Yellowstone’s posted speed, the powertrain eased us along effortlessly. Then in controlled sections where we could engage to warp speed, the drive came on as smooth as we could ever imagine. The new Genesis ultra-performance reminds us of Yamaha’s Apex four-cylinder with its smoothness. We’re not getting the full shriek of the Apex at full throttle, but the R-TX emits an encouraging performance note to let you know that it’s onboard with your desire to go fast. Snow build up will be minimal thanks to the louvered runningboards on the R-TX. 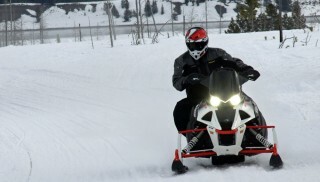 In the real world of snowmobiling, the Sidewinder R-TX may not satisfy some male egos. It’s probably quieter than the normally aspirated Viper 1049cc triple. There is no Hemi rumble; no Apex scream. The turbo R-TX could be a stealthy runner, which can come in handy if you choose to run a lake bed against an unsuspecting triple-piped hot rod. The R-TX turbo is a runner at any speed. To get this new Yamaha drive under the hood of the existing Viper design required a little plastic surgery, mainly adding extended side panels and revising the nosepiece to ram more cooling under the hood. The end result is a sled that looks a bit more macho than the Viper. The Sidewinder looks like it hangs out at the gym, toned and muscular. Not overly so, but with enough bulk through the shoulders to let you know it can get down to business when provoked. Styling-wise the Yamaha and Cat models have their own look, despite their similarities. The sport seat is action-ready and if you want, you can specify an optional heated version for end-of-the-day comfort. Similarities include the shared front and rear suspensions. Although these pieces have brand-specific nomenclature, they work the same. The tall spindle, double A-arm front end that Yamaha calls the SRV offers up to 10 inches of travel. Depending on which R-TX version you have, LE or SE, the front will be fitted with high performance shocks. The SE model, which is the in-season offering, uses Fox’ latest aluminum-bodied, rebuildable 1.5 Zero RC shock with an adjustable coil spring assist. The clicker feature adjusts both compression and rebound rates. The pre-season R-TX LE version came with the three-way lever adjustable QS3 edition of the Fox 1.5 Zero shock. We found the Yamaha Dual Shock 129 rear suspension, which is Yamaha-speak for the Cat-designed slide-action rear suspension, works exceptionally well with the Sidewinder’s turbo. Again there is a shock difference between the SE and the early purchase LE. You get premium Fox QS3 shocks on the LE, your payback for deciding to buy early. The in-season SE features good, but not as adjustable aluminum-bodied HPG shocks on the center and rearmost shock control arms. The upgraded shocks make accepting the LE’s US$600 premium when ordering early worthwhile. 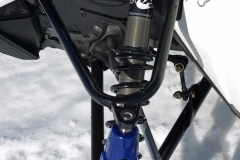 The in-season SE features good aluminum-bodied HPG shocks on the center and rearmost shock control arms, while early season LE buyers got premium Fox QS3 shocks for deciding to order early. 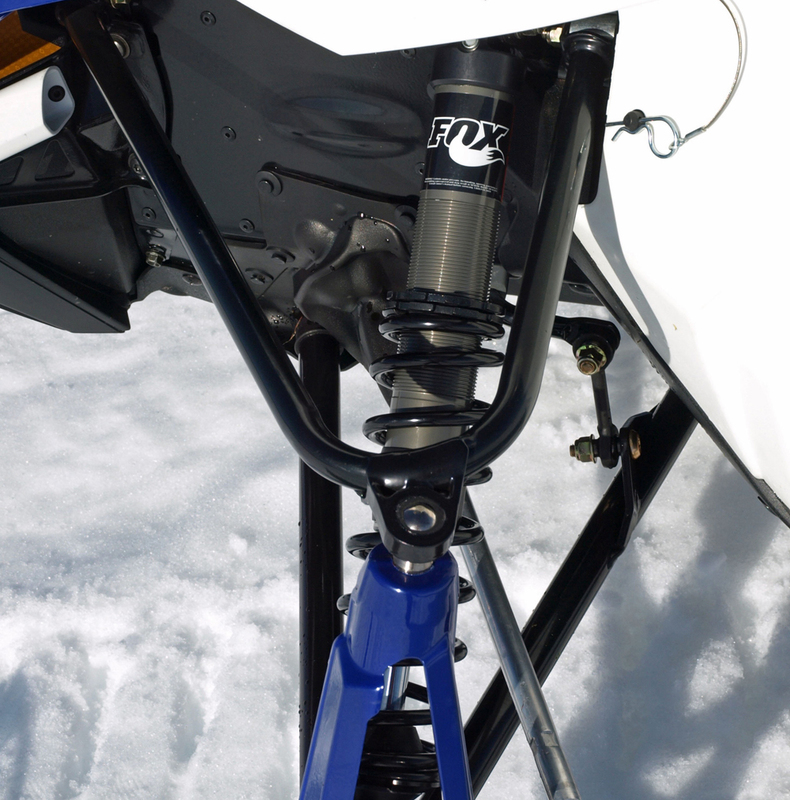 The Sidewinder R-TX maximizes the benefits of the rear suspension’s slide-action feature, which helps control the sled’s front end lift under quick and full throttle inputs. Ski-Doo’s rMotion and Polaris’ AXYS designs essentially do the same thing, but with a bit more gimmickry. The R-TX system seems more straightforward and, in our estimation, equally as adept. Having looked at Polaris’ all-new IGX 144 dual rail rear suspension, we’re wondering if Polaris may be coming back around to a trail version of that design that may offer similarities to the Cat system. We have to believe that it costs less to manufacture this slide-action suspension than a multi-action one like the Pro-XC design Polaris uses on its AXYS Rush and Switchback models. The Yamaha Sidewinder R-TX works very well controlling the 13.3 inches of travel with its Dual Shock 129 design. With the power of the Genesis turbo, we admit that we prefer a longer track for its added stability over bumps and its slightly better grip. 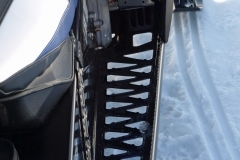 Still, though, the 129-inch Ripsaw track is a proven design and seems to be the new standard for high performance trail sleds. It works well and reflects positive results as Cat has used the 129-inch length for a number of years. We note that Ski-Doo’s newer trail performance models, including the new MXZ 850 models, come with that length. Although Polaris stays with the 121-inch length on its new XCR, it does specify the 1.35-inch lug profile. Power and traction come together on the R-TX to offer riders exceptional performance. 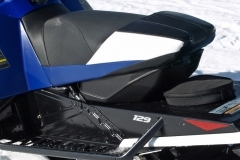 And while this sled bears unmistakable character points from its Cat partner, Yamaha’s R-TX adds brand-specific differences like the use of a brand new Tuner III ski, engineered specifically for the SRV Chassis and the unique characteristics of the Sidewinder R-TX. This proprietary ski is a deep keel design intended to reduce ski-pressure for less effort in steering. Plus, the dual keel design is claimed to deliver consistent bite in the corners and a reduction of on-trail darting. 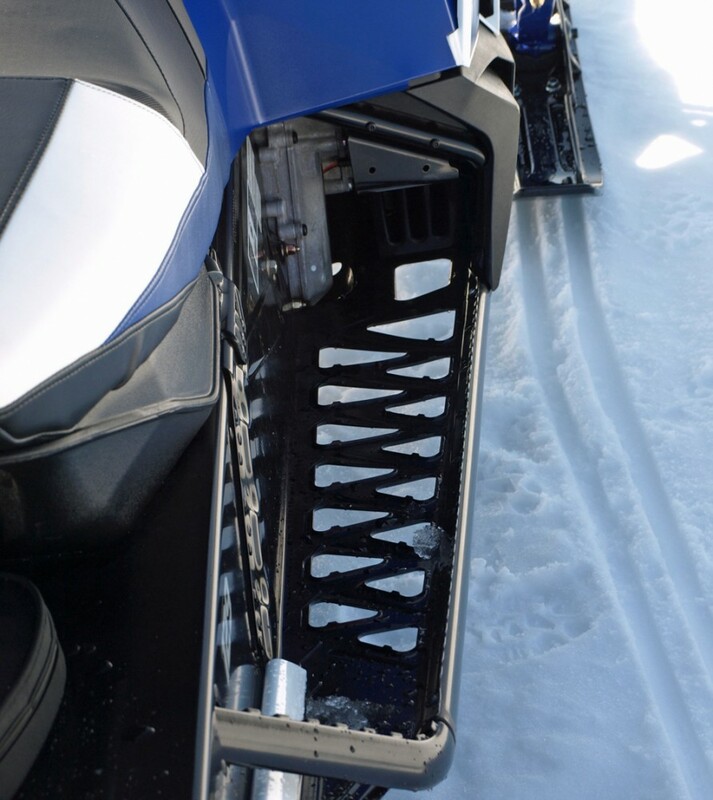 With an assortment of dealer-available easy-to-change carbide runners in a variety of insert lengths, you can personalize the sled’s handling. There’s lots of information beyond MPH and RPM available with the digital gauge pack. This new more powerful R-TX may be about horsepower and handling, but it is also an ergonomically well-designed sled as well. The saddle invites performance. Plus, you can get it heated, which is standard with the LE model! The curved handlebars are about as good as they get in the sled biz. 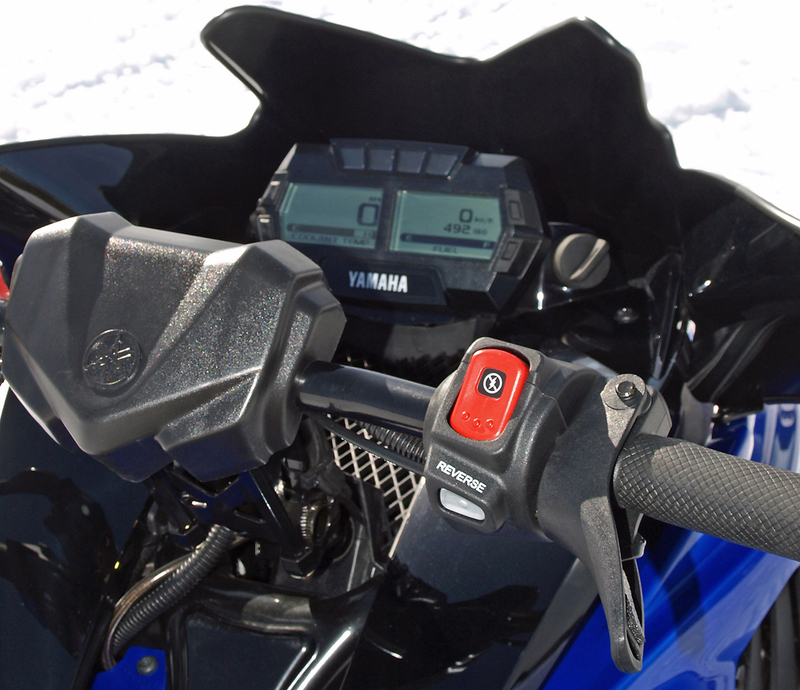 And sitting just ahead of the bars and the digital gauge package is a goggle bag with a mesh bottom to allow engine heat to keep a spare set of goggles or gloves warm. Convenience features include the electric start and push-button mechanical reverse. The LED tail light is an extra bright high-intensity unit for added safety and longer life. The brake is a hefty Hayes performance design with dual-piston caliper working on an oversized, drilled rotor for exceptional stopping power. And then there is that Yamaha brand promise of top quality, full warranty and exceptional dealer support. Fast, powerful, smooth, unique, comfortable, what’s not to like?